Today’s facility and IT managers are facing multiple challenges in managing corporate facilities. The corporate facility includes various areas such as the commercial building, manufacturing floor, warehouse, remote sites, and data center. All of these corporate facilities require different attention from the managers to meet the corporate sustainability goals set forth by the executive team. Goals that mainly revolve around reducing CapEx and OpEx costs by performing energy reduction, capacity planning, equipment life-cycle-management, and provide a productive and collaborative work environment that the manager has to deal with on a continuous basis. These top-of-mind issues require accurate data collection, and are converted into useable information to enable smart decision-making. At the same time, the manager is asked to perform all of his or her daily activities with less staff to reduce overhead cost. This “do more with less” phenomena requires the manager to utilize the latest Information Technology to gain insights into areas that need improvement through the use of Building Automation Systems and benchmarking against industry metrics. A good Building Automation System empowers organizations to reduce operational and capital expenses, improve visibility of key operational data, and enable sustainable, energy efficient facilities. Building Automation System describes the system of controls that has the advanced functionality to monitor, manage and control building equipment. Types of equipment include water, gas, electricity metering, heating, ventilation, air conditioning equipment, lighting, surveillance, access control, digital signage, and fire life safety monitoring. In most cases, each system operates in silo with little or no communication to each other. Each of the systems gathers data individually and stores the data with its own format, thus requires the facility manager to compile all the data manually from several locations to gain visibility to the condition and usage of the facility. This introduces many problems with facility management in wasted resource and time, questionable accuracy of energy accounting, and inconsistency in the reporting metrics. This entry was posted in Industry News, Industry Resources and tagged bms, Building Automation System, green buildings, intelligent buildings, smart buildings on May 2, 2014 by setpointsystems. Buildings are improving, becoming more comfortable but also more efficient in use of energy and water. How can this adoption of best technologies and designs be accelerated? A panel of experts at the Rocky Mountain Green Conference held in Denver recently agreed that examples help. And Colorado has many examples. While energy-efficiency has drawn much attention, he added, the conversation about sustainability should also encompass water use, indoor air quality, and proximity to mass transportation. All are criteria used in the U.S. Green Building Council’s LEED evaluation process. Some of Colorado’s best examples are found at the National Renewable Energy Laboratory, located just off I-70 in Golden. The campus has six buildings certified at the highest level of LEED certification, platinum. One of them is the world’s largest net-zero energy building. 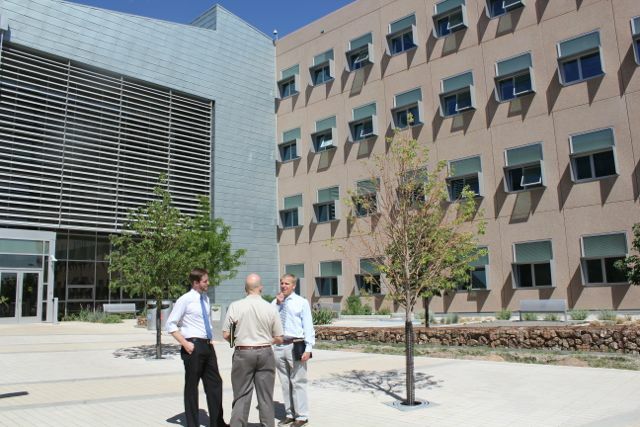 NREL uses techniques, such as maximizing use of existing daylight, to reduce need for artificial lights, and maximize solar collection. The parking spaces are covered with photovoltaics. On hot summer afternoons, the building produces more electricity than it consumes. Other times, it must draw on the grid. As such, most net-zero buildings rely upon carbon energy for backup. But it’s easier to hit such lofty goals in building performance when you start from scratch, pointed out Frank Rukavina, sustainability director at NREL. He noted that residential and commercial buildings account for about 40 percent of all energy use in the United States. As such, they represent a huge opportunity for potential savings. Much is happening in Denver. Jerry Tinianow, chief sustainability officer for the city government, said that municipal buildings have become 20 percent less energy intense, with an additional goal of milking another 5.6 percent in savings as compared to the 2005 baseline. Denver is also trying to help create other models. One is at the former Lowry Airfield, on the border with Aurora. There, a 70-acre enclave called Buckley Annex is being planned as a net-zero neighborhood, meaning the amount of electricity consumed on site in homes, businesses and other community infrastructure will be no greater than the amount that is produced there. Another project aims for net-zero in commercial buildings downtown. It is moving forward under the auspices of Architecture 2030. “What we really like about it is it’s a voluntary association and not a city-mandated association of buildings, and it’s one in which the government plays a secondary role,” said Tinianow. If buildings produce their own energy, they won’t rely upon utilities for outside generation, at least not in the same way. Such dispersed production is called distributed generation—and it’s worrisome to utilities whose business model for the last century has consisted of earning revenues based on the volume of electricity sold. According to Mark Schwartz, representing Xcel Energy on the panel, “We are trying to find a way to embrace that,” he said of local, distributed energy generation. New financial instruments that allow savings of energy efficiency to be financed will become more important moving forward, said speakers. Ackermann noted legislation was passed last year to allow PACE programs for commercial buildings, giving building owners the ability to improve paybacks on investments to make buildings more green. This entry was posted in Industry News, Industry Resources and tagged Colorado, Energy, green buildings, netzero, nrel on May 1, 2014 by setpointsystems. A recent study of facility management executives found that 5 percent had certified a green building before 2012, but that 29 percent plan to certify one in 2013. That growth in the market for green buildings will ripple through the industry. Over the next ten years, buildings will become more grid-responsive, resilient, efficient, energy-positive and networked. A survey indicted that 14 percent of U.S. building organizations currently participate in demand response programs. Building energy consumption can be continuously adjusted throughout the day to reduce demand at critical times. To withstand natural disasters, there is an important role for distributed energy systems and smart building controls. “The new approach would define policies and technical requirements for how to incorporate smart grid technology, microgrids, building controls and distributed generation, including CHP, with two-way flow networks into the grid. … This approach would allow building controls to provide a minimal level of service such as basic lights and refrigeration during emergencies,” the Hurricane Sandy Rebuilding strategy noted. Building efficiency improvements in lighting, HVAC and controls are the most popular improvements and more than two-thirds of organizations have addressed these in the past year. There is a growing trend in building design to go net zero or energy positive. In fact, California has included net zero as an energy goal for 2030 for commercial buildings. The U.S. Department of Defense and the U.S. Army have also set energy-positive goals. Smart buildings provide data and information needed to measure, monitor and manage building performance. This entry was posted in Industry News, Industry Resources and tagged 5 Ways, BAS, bms, Building management system, Facility management, green buildings, how to, U.S. Department of Defense on March 25, 2014 by setpointsystems. Facility managers should determine if deferred capital renewal should be part of the analysis to justify large energy upgrades. An example of a deferred capital savings is the evaluation of installing a new boiler as compared to maintaining the existing boiler. A 20,000 pound per hour (pph) boiler with mud and steam drums (the heart of the boiler) may be in good condition, but the boiler tubes could be thinning and need to be replaced. The cost to retube and recase this boiler is approximately $350,000. In this example, the recasing and retubing of the boiler will not increase the boiler efficiency of the system. Also, the existing boiler is assumed to have an efficiency of 75 percent. A newer boiler with stack economizer could have an efficiency of 85 percent and the cost to install this boiler is approximately $1.2 million. In 2012, the average national cost for natural gas was approximately $8.15 per thousand cubic feet or approximately $8.00 per million BTU. Assuming the boiler operates at full load for 2,500 hours, the increase in efficiency would save the facility approximately $62,000 per year in natural gas costs. The simple payback to replace the boiler without the deferred capital is 19.4 years (capital cost of $1.2 million and an annual savings of $62,000 per year). However, if the analysis took into account the $350,000 cost to recase and retube the boiler, this would reduce the capital cost from $1.2 million to $850,000 and the corresponding simple payback would be reduced to 13.7 years. The cost to recase and retube the boiler should be included in the analysis because this work needs to be completed to maintain the operation of the system. Another example is the replacement of a 30-year-old water chiller. Typically, chillers installed at this time were constant speed units. Based upon ASHRAE numbers, the average service life of a water-cooled chiller is 23 years. That does not mean that, once a chiller has been in service for 23 years, the unit will fail, but rather that a plan for the chiller replacement should be in place based on that average service life. A 450-ton constant speed water-cooled chiller has been designed to have a chiller efficiency of 0.70 kW/ton, but because of the age of the equipment the chiller could be de-rated to an efficiency of 0.81 kW/ton, assuming a 0.5 percent per year degradation. A variable flow chiller unit can be selected to operate with an efficiency of 0.50 kW/ton. Based upon the unit operating at full load condition for 1,500 hours and an electric rate of $0.08/kWh, the annual savings for installing the VFD unit is approximately $16,700 per year. The cost for the new VFD chiller system is estimated to be $250,000. This would correspond to a simple payback of close to 15 years. If the analysis included the cost to replace the unit with a constant speed chiller (assuming the cost of $203,000), the difference in capital costs is only $47,000 and the simple payback would be reduced to 2.8 years. Even if the analysis assumed that the constant speed chiller was installed with the original efficiency (0.70 kW/ton) the simple payback is still 4.3 years. It is difficult to identify the deferred capital savings in terms of simple payback when evaluating equipment that still has useful remaining life. The cost to replace the equipment cannot be simply subtracted from the cost of the energy conservation measure. However, a complete life cycle cost analysis can be completed to identify the most economical approach. Andy Jones, PE, is mechanical engineer/project manager at RMF Engineering. He can be reached at andy.jones@rmf.com. This entry was posted in Industry News, Industry Resources and tagged bms, Building Automation System, engineering, green buildings, HVAC, Setpoint Systems Corporation on March 20, 2014 by setpointsystems. Once a bundle of projects has been identified, facility managers should also determine whether a reduction in maintenance expenses can legitimately be anticipated. Facility managers should determine if deferred capital renewal should be part of the analysis to justify large energy upgrades. An example of additional maintenance savings that will lower the simple payback is a lighting project that changes out incandescent bulbs to CFL or LED bulbs. The typical lifespan of an incandescent light is approximately 1,200 hours, while a CFL has a life span of 8,000 to 10,000 hours and a LED light has a life span of 20,000 to 50,000 hours. The cost of the material and the time for repeatedly replacing the bulbs should be included in the analysis to identify the entire savings for the energy conservation measure. Another maintenance savings example is replacing building pneumatic controls with a direct digital control (DDC) system. Pneumatic control systems use compressed air, which is typically generated by a compressor (or series of compressors, depending on the size of the system; some rare installations use nitrogen or other bottled gas). Typically the annual maintenance can be 40 man-hours for inspections and the scheduled monthly maintenance service required. If this work is completed by a third party it is easily tracked and identified, but it is more difficult to identify the hours if this work is completed in house. This entry was posted in Industry News, Industry Resources and tagged bms, Building Automation System, energy efficient, green buildings, HVAC on March 19, 2014 by setpointsystems. A key step in justifying many large capital upgrades is to bundle them with other work that has a quick payback. There are a wide range of quick win strategies to bundle in with more complex endeavors. Low-cost or no-cost projects can be implemented by facility managers in conjunction with standard operations and maintenance procedures. For example, the facility manager can ensure that the outside air dampers for the air handling units are operational during peak cooling and heating conditions. If the dampers are not functioning properly and remain fully open during the winter months, the result would be an increase in energy use. The HVAC system would be trying to maintain the heating set point based on a lower mixed air temperature, due to the increased amount of colder outdoor air added to the warmer return air. If the dampers are functioning properly, the temperature rise would be much less and require significantly less energy. Revisiting the applicable ventilation air requirements is another easy way to save energy. 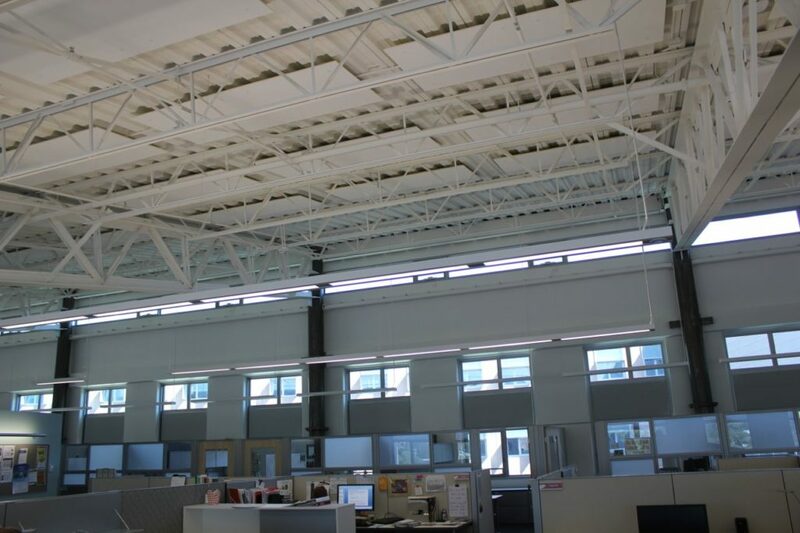 If a space previously used as a lab or a classroom is now an office, the amount of required outdoor air changes, i.e., the damper set points, could be altered. Also, changes made in space use often do not include HVAC system rebalancing. A space is often repurposed without any modifications to the HVAC system. In a bundling strategy, the next step up from no- or very low-cost energy efficiency measures involves relatively small projects that may require an engineering design or additional evaluation. One example is the installation of variable frequency drives on motors. For example, a 20 horsepower pump operating 24 hours per day for a quarter of the year (91 days) with $0.08/kWh electrical cost will incur an electrical charge of $2,890 per year, assuming a motor efficiency of 90 percent. The installation of a variable frequency drive will allow the pump to operate at decreased flow and pressure throughout the year. The flow will decrease at the same rate the motor speed decreases. The energy costs decrease as the cube of the flow (motor speed) decreases. If the installation of the variable frequency drive reduces the flow by 25 percent, then the resultant reduction in energy use is 58 percent. However, the reality is that approximately 50 percent energy savings will be obtained. The savings for this project is approximately $1,450 per year. Based upon RS Means, the average installed cost for a 20 horsepower pump is approximately $4,000 to $5,000 depending on location. The simple payback for this energy conservation measure is approximately 2.7 to 3.5 years. All analyses of energy conservation project paybacks should of course be based on actual power rates paid by the facility. The impact on demand charges should also be considered. This entry was posted in Industry News, Industry Resources and tagged bms, Building Automation System, Bundling Energy, energy efficiency, energy payback, green, green buildings on March 17, 2014 by setpointsystems.